Producer: Joris Ivens; screenplay: Joris Ivens; photography: Joris Ivens, John Fernhout, Joop Huisken, Helen van Dongen; editor: Helen van Dongen; music: Hanns Eisler. Cast: Joris Ivens ( Narrator ). Eisler, Hanns, and Theodore Adorno, Composing for the Films , New York, 1947. Van Dongen, Helen, and others, Joris Ivens , edited by Wolfgang Klaue, Berlin, 1963. Wegner, Hans, Joris Ivens: Dokumentarist den Wahrheit , Berlin, 1965. Kremeier, Klaus, Joris Ivens: Ein Filmer an den Fronten der Weltrevolution , Berlin, 1976. Passek, Jean-Loup, editor, Joris Ivens: 50 ans de cinema , Paris, 1979. Ivens, Joris, and Robert Destanque, Joris Ivens; ou, La Memoire d'un regard , Paris, 1982. Bakker, Kees, Joris Ivens and the Documentary Context , Amsterdam, 1999. Schoots, Hans, Joris Ivens: Living Dangerously , Amsterdam, 2000. New Republic (New York), 15 April 1936. National Board of Review , May 1936. Today's Cinema (London), 14 June 1944. Monthly Film Bulletin (London), May 1945. Variety (New York), 3 March 1947. Cinema Nuovo (Turin), 15 February 1953. Ferguson, Otis, in The Collected Film Criticism of Otis Ferguson , Philadelphia, 1971. Hogenkamp, B., "Joris Ivens and the Problems of the Documentary Film," in Framework (Norwich), Autumn 1979. In 1930 the Dutch Building Trades Union commissioned Joris Ivens to record Holland's reclamation from the North Sea of a half-million acres of the Zuyder Zee, her "inland sea," for agriculture. The project involved 12,000 men working on a two-shift basis for ten years, and caught the international imagination, as a wonder of world engineering, although the unions had a special interest in labor's contribution. 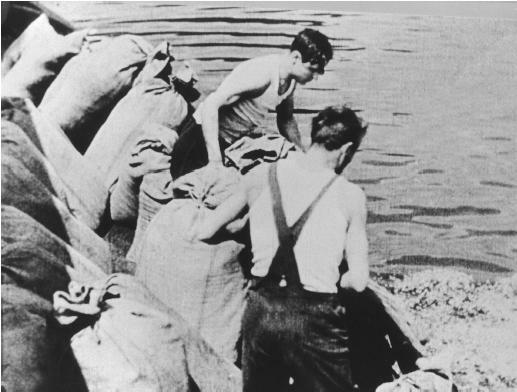 Ivens's camera-team (John Fernhout, also known as Ferno, Joop Huisken, Helen van Dongen, Eli Lotar, and Ivens himself) filmed the work over three years, alongside other industrial documentaries (some are often misdescribed as spin-offs from this project; no doubt Ivens re-used material as convenient). Scarcely was a film called Zuyder Zee assembled (45 minutes, 1933, silent) than the Depression hit Dutch agriculture, and the wheat grown in the laboriously reclaimed land was burned or fed to pigs. The outrageous irony provoked Ivens to shorten the existing material, overlay music by a "leftist" composer, and add an epilogue, combining new material, newsreel footage, a few "staged" shots, an accusatory voice-over, and a sarcastic song à la Brecht, to denounce the global capitalist system. The new version was banned in most countries, and most Anglophone viewers will know only a "shorn" version derived from it, using Eisler's music but omitting the epilogue; it's reputedly a wartime edit, devised to elicit admiration for our Dutch allies. The Zuyder Zee sections make pictorially striking, dynamically edited, documentary narrative; they go from the initial dredging-up of sea-bed boulder-clay, and its redeposition as a sea-wall, to the closure of the last gap, through which the North Sea's violent currents flow only more fiercely as men and machines narrow it. What risked being either a dry record of constructional procedures, or a mere symphony of forms rhapsodising over man's battle against nature (or some such generality), discovers instead what can for shorthand be called the poetics of material structuration . The seabed becomes a barrier against the sea, hydraulic jets set sand flowing like water against water, the screen becomes a flux of forces involving salt water, fresh water, basalt slabs, steel claws, clay sticky or dripping, vast "mattresses" of woven willow, the mechanical and the manual, the hard tight shapes of machines and the formless but indefatigable sea. The spectator not only grasps this dialectic intellectually, thanks to that elementary but uncommon virtue, clear exposition, he also feels it, as it were in his muscles, thanks to Ivens's remarkable kinaesthetic sense. In My Camera and I Ivens describes how he selected the camera-angles for the stone-lifting sequence by closely analysing, and then repeatedly performing, the job himself; on discovering that the greatest strain came at the shoulder-muscles and on the chin, he used these "organic" work-points as visual motifs—which "happened to be the most beautiful angle" (exactly as the era's materialistfunctionalist aesthetics, which surely influenced Ivens, would predict). Otis Ferguson brilliantly analyses the cutting's precise response to detail, to the exact interactions of operators, controls, ad machines. Ivens structured the closure of the last, 32-km., gap (at 1302 hrs on 28/5/32) as a "dramatic dialogue." "One of our cameras was the land-camera and the cameraman identified himself with the land's fight against the sea. . . .Another camera was the sea-camera , it said: 'My current is strong, I will be here after you have given up and gone away. . . .' The third camera identified with man and machines sharing human effort." Though individual shots may seem as impersonal and alienating as Dziga Vertov-type "enthusiasm," the structure generates an "organic pathos" according to Eisenstein, while the muscularity of man and machine evokes Flaherty and the ditch-digging of Vidor's Our Daily Bread . It's a remarkable synthesis. The first protrusion of man's submarine mountains from these angry waters is strangely poignant, providing a rare provocation to celebrate industry as something itself primeval, yet nobly creative. Eisler's music is brilliant: the expression in sound of hard energy, gutsy yet pure; thanks to its prominence, one might almost say that the film honours industry as a "symphonic" activity, as an expression of organising intelligence, just as "high" as music is. Entirely different in style, the final section makes an extremely effective tract, but is no more the last word on "capitalism" than the Depression was. Though such a reading would surely distress Ivens, who became increasingly uncritical of any Communist regime, it's arguable that the usual, shorn version of the film is complete in itself, and constitutes a Social-Democratic counterpart to Leninist montage epics like Turksib . A Cahiers du Cinéma critic suggested that the shots of children happily playing would then have suggested "our nation's future," and reminded contemporary spectators that the Dutch government organised the project without incurring one loan to burden its children with debt.